According to Wikipedia: 8888 Uprising was a national peaceful revolution demanding democracy that started on August 8, 1988, in Burma (now Myanmar), when university students started the initial demonstrations in Rangoon. The Uprising ended on September 18, 1988, after a bloody military coup by the State Law and Order Restoration Council (SLORC). Thousands, mostly monks and civilians (primarily students) were killed by the Tatmadaw (Burmese armed forces). I spent a month in Asia in early 1989, and was fortunate enough to purchase an entry visa into Burma from Thailand. 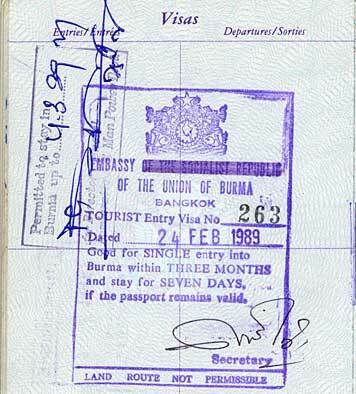 On February 24, 1989, my passport was stamped number 263, meaning the Burmese government admitted less than 300 tourists that month. Only four months earlier, the military regime had killed an estimated 3,000 civilians during the 8888 Uprising. This slideshow of photographs from 1989 is dedicated to the people of Burma — as they again confront one of the most brutal regimes in the world. During my visit, the country was still known as Burma, and it's largest city was named Rangoon. In June 1989, SLORC adopted the name "Union of Myanmar." This name was recognized by the United Nations, but not by the U.S. or U.K. governments. Rangoon was simultaneously renamed Yangon. In November 2005, the military junta began relocating the capital to Naypyidaw, which was officially named as the new capital in March 2006. These images are amateur tourist photographs. Hopefully, something of the beauty of Burma is evident nonetheless. There are virtually no people in these photographs: my entire visit was state-supervised and I was frequently warned that my camera would be confiscated if I was caught taking pictures of people. Therefore these images are effectively censored of the people of Burma. At the Shwedagon Pagoda in Rangoon, my guides pointed out stains in the pavement where blood marked the killings from only months before. I cannot confirm the veracity of these statements, although killings on this site have been confirmed. This is again the site of massive demonstrations: "On September 24, 2007, 20,000 monks and nuns (largest protest in 20 years) marched at the golden Shwedagon Pagoda, Yangon... On September 26, 2007, clashes between security forces and thousands of protesters led by Buddhist monks in Myanmar have left at least five protesters dead by Myanmar security forces, according to opposition reports." While in Rangoon, I stayed at The Strand. It was suitably rundown to qualify as a venue in a Graham Greene novel, including the bedbugs and foot-long lizards. It did not have a fancy website offering first-class accommodations in 1989. These photographs have sat in a slide box in a drawer since 1989. I also visited Thailand during the same trip, and I am fearful that some images of Thailand may be among those I am representing as Burma. I apologize in advance for any mistakes. It is not my intent to confuse Burma and Thailand — it has been many years since my visit. Corrections are welcome. Thanks for posting this on behalf of those suffering in Burma. Photograph no. 14 - the script written in chalk on the blackboard is definitely Thai and probably from your travels in Thailand. The photograph preceding that however, a document in Burmese script. Thank you for a thoughtful, timely post. Is that you standing next to the little ones in the first slide? Rathna, thank you for your correction. Looking at typographic forms, you are obviously correct that no. 14 is Thai and not the rounded Burmese script. We will remove this image from the slide show. Jason Tselentis, yes, that is me in the first image, many years younger. Today, ABC News reports that perhaps hundreds have died in the newest uprising against 45 years of military rule and deepening economic hardship. Beautiful photo's! It's a shame you couldn't take any pictures of the people. They make the country, so to me they are always essential to get a feeling of the country. Hope to go there myself some day. Am i correct, when looking at your visa, that you couldn't take the overland route? You had to fly in from Thailand? Thank you for this, Bill. I spent 24 days in Myanmar this past January, and I was overwhelmed by the amazing people and spectacular places I found there. I'm horrified by the violent actions taken by the government, but I applaud the Burmese people for resisting their brutal government. It's a shame that one of the few countries leading the call for international action is the United States, and an even deeper shame that we have squandered our credibility on the world stage at a time when the people in Burma could use our help the most. Also, there are lots of photos on my Flickr account (scroll down to January 07). Thanks again for raising awareness of this issue, Bill. In a surprise development the UN special envoy Ibrahim Gambari today met detained Burmese pro-democracy leader Daw Aung San Suu Kyi in Rangoon. The visiting envoy met the Burmese Nobel Peace Laureate for ninety minutes at the State guest house in Rangoon. 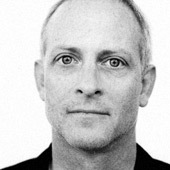 By the way, you were principal of the very successful design firm Drenttel Doyle Partners in 1989. How did you ever take a whole month off to travel that February? I was lucky enough to spend a week in Burma almost 10 years earlier, in 1980. It is one of the most spectacular places on earth, and the people are incredible. It has an affect on me all the time, even now, almost 30 years later. Your photos of Pagan take me back- if any place on earth deserves to be a world heritage site, it is Pagan. And Mandalay. And Rangoon. I, too, stayed in the Strand, and remember getting up at 5am to make a flight to Mandalay, and finding a huge, dead rat lying on the marble floor in front of the reception desk. But I also fondly remember eating at the Nylon Ice Cream parlor in Mandalay, and rushing to one of the two restaurants in town that served beer, by 5pm, as the daily shipment from the Peoples Brewery in Rangoon usually ran out by 7. As americans,we should be ashamed at how little our government has done to help the Burmese people. I was born in Burma in 1976 and moved in England in 1979 where I was raised. I moved again in 2001 to Chicago where I now work and live as a designer. In 1988, my family and I went to visit the hundreds of relatives I still have there. We were there about three weeks before the major demonstrations happened. It was my first trip to Burma since emigrating and I couldn't really fathom the bizarreness of the situation. For instance, the military junta were afraid of a student uprising, so they had simply closed all the schools and universities several months prior. No schools means no place to organise a student protests, right? I remember visiting my cousins, watching quietly as neighbors sneaked their kids around to get them home schooled. On the last day of our holiday, as we fly out the country, we heard the news that mass demonstrations had started on the streets. It took me years to fully understand the seriousness of the events that day and the weeks building up to it. We were lucky to have gotten out the country that day. The military behaves with the attitudes of a petulant, rash, unstable teenager. One that believe the whole world revolves around and that if it weren't there, the entire country would collapse. I went back a few years ago. The feeling that 'the rich got richer and the poor just stayed poor' was hard to ignore. I too visited Burma. On the first night we met in the Strand? for Drinks. A very limited supply of whisky behind the bar. That night a cerfew was imposed. Bed 6 O`clock. Shwedagon the next day. Military raid with Machine guns when they had raced up the stairs they all stopped to take off their shoes in homage to the gods...and allow any students to run away. Train to Mandalay upper class, stayed in an old British hotel reached by horse and trackwith the same menus and menu from 40 years previously. Down the irriwaddy river? by steamboat, stopped in pagan. Took train again to Rangoon, rails ripped up by protesters. Took "tourist Burma" Taxi with bullet holes in it. As we neared the airport tanks were aiming down the street, took a shortcut through the university with applauding students. Made the airport just in time for flight. Military looking to confiscate cameras and films. Memorable few days, managed to get to bangladesh where there was flooing. Just managed to lease the next day for Napal. On the day we left there was an eartquake. Rang mum to say we were O.K., "i never thought othewise dear what have you been up to"